Below is my second contribution to Jim Emerson’s Contrarianism Blog-a-Thon, running all weekend at Scanners. My earlier contribution can be found right here. The best animated picture of 2006 wasn’t made by Pixar, Disney, DreamWorks, Blue Sky, Warner Bros. or Sony Pictures. It didn’t feature any talking or dancing animals. It wasn’t directed by Nick Park, Hayao Miyazaki or George Miller. It’s neither CGI nor drawn. Hell, it wasn’t even released in the US last year. Last Christmas I was out shopping with my two sons. We visited the local electronic store looking for a new microwave oven, when I suddenly had this creepy sense of being stared at. I looked on my left to a wall covered with about fifteen giant flat-screens, all tuned into the same broadcast, and saw a pack of wolves staring right back at me, moving in perfect sync. It was a moment straight out of a dream. ‘What’s that?’ I whispered when I noticed that my boys were as fascinated as I was. I nodded and thought to myself: stop-motion animation. Our eyes were glued to the silent TV-screens. Apart from the wolf-puppet, we saw an intense-looking kid wearing a brown leather hat, a bird, a cat and a duck. 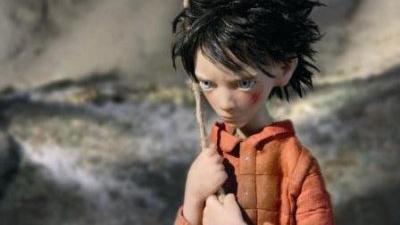 I got home, started googling and learned about an ambitious 29-minute short called, yes, Peter & the Wolf. Five years in the making. Produced in Poland. Shot on high-definition cameras. Directed by a female Brit by the name of Suzie Templeton. Music performed by the Philharmonia Orchestra, conducted by Mark Stephenson. Apparently, it premiered at the Royal Albert Hall last year alongside a live performance of the orchestral score. Being the animation enthusiast that I am, I couldn’t help wondering why I’d never heard about this project before. Two weeks later, the DVD arrived from Amazon.co.uk. The boys and me sat down before the television and we pressed play. What we witnessed was an outright masterpiece. You see, as much as I enjoyed listening to that Prokofiev tape as a kid, a part of me was always a little let-down by the paper-thin story. Frankly, I couldn’t care less for the bird, the cat and the duck. 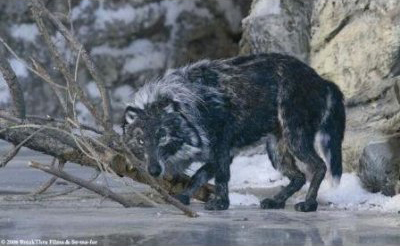 It took ages for the wolf to arrive! This adaptation, however, took all these familar ingredients and made them work in every single way. The characters had been fleshed out properly, just like the action, and the lavish production design, the exquisitely sculpted puppets (not too cute!) and gorgeous cinematography were simply flawless. I had to work out how to visually tell the story, how to arc it and stretch it to the music, so that it keeps the viewer’s attention, and doesn’t just fill time but builds visual sequences that correspond to each musical theme. Templeton’s first stroke of genius was to get rid of the traditional narration. As a true visual stylist, she decided early on to let her images do the talking, which meant that words and dialogue were ruthlessly abandoned. Mind you, we’re talking about half an hour of pure pantomime here! But wait, there’s more: Prokofiev’s world-famous composition – obviously the backbone of the whole enterprise – doesn’t start until six minutes into the movie. Instead of using the musical themes to establish the basic story elements, we’re familiarized with Peter’s ghoulish, claustrophobic world by listening to the howling wind on the other side of the fence, and the creaking backdoor that his overprotective Grandfather keeps firmly locked. It’s only after the tormented boy finds a way to sneak out of the house and into the woods where sunshine hits his face, that the string theme sets in as a breath of fresh air. Cinema doesn’t get more cinematic than this. I could go on and wax rhapsodic about the beautiful frozen lake; about the muted color palette and the wide range of fabrics and materials that makes every shot a feast for the eyes; about the intricate sequence where Peter catches the wolf (an almost Brian De Palma-worthy set piece) and hundreds of cinephiliac moments crammed inside those 29 minutes. A personal favorite is when we hear the English horns play the wolf’s theme for the very first time. Instead of cutting to the approaching wolf directly, Templeton dares to show a 30 seconds long close-up of Peter, sensing the wolf’s presence. It’s a perfect set-up for the drastically altered ending – which I won’t reveal here – that would have Carl Jung clap his hands with glee. The tag-line for this adaptation is “Boys like Peter are not afraid of wolves.” Now that I’ve seen Templeton’s film, I know why: Peter is the wolf. 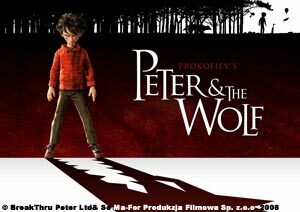 Peter & the Wolf – a co-production of UK’s BreakThru Films and Se-Ma-For Studios in Lodz, Poland – is available on region 2 and 5 DVD only and can be ordered here. Go ahead, you won’t be disappointed. It’s worth buying a region-free player for. To see an early short by Suzie Templeton, visit AtomFilms. yes Peet, zapped into this when it was broadcast on Dutch television and was quite overwhelmed by it. Amazing. That would’ve been around the time I was visiting my local electronic store, then… I never can beat you when it comes to discovering the obscure! Peet, if perchance you hear of this getting an All Regions DVD release I hope you’ll let us know! And this kind of “film critic contrarianism,” the kind that talks about films hiding in the shadows, is my absolute favorite, so… cheers! Great entry Peet — though frustrating that I can’t view it myself. Hope this makes it to All Regions. For what it’s worth: My Peter & the Wolf copy is region 5 as well as 2. Too bad you guys are in region 1 territory. I’m not that much of a collector, but I couldn’t survive without my region-free player! Yes definitely a superb film. When I saw it at Annecy there was little doubt it would win the Crystal. Destined to be an animation classic.